China’s shadow banking sector has been a major source of speculative lending to the global economy. But 2018 has seen it entering its end-game, as our first chart shows, collapsing by 64% in renminbi terms in January to April from the same period last year (by $274bn in dollar terms). The start of the year is usually a peak period for lending, with banks getting new quotas for the year. The downturn was also noteworthy as it marked the end of China’s lending bubble, which began in 2009 after the financial crisis. 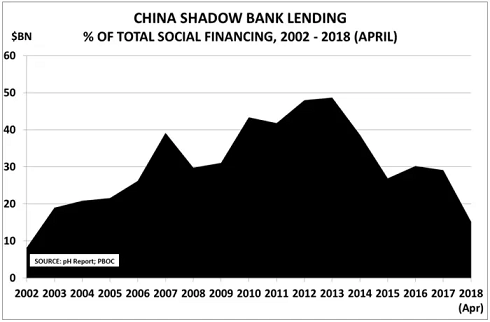 Before then, China’s total social financing (TSF), which includes official and shadow lending, had averaged 2 times gross domestic product in the period from 2002 to 2008. But between 2009 and 2013, it jumped to 3.2 times GDP as China’s stimulus programme took off. It is no accident, for example, that China’s Tier 1 cities boast some of the highest house price-to-earnings ratios in the world or, indeed, that Chinese buyers have dominated key areas of the global property market in recent years. The picture began to change with the start of President Xi Jinping’s first term in 2013, as our second chart confirms. Shadow banking’s share of TSF has since fallen from nearly 50% to just 15% by April, almost back to the 8% level of 2002. TSF had already slowed to 2.4 times GDP in 2014 to 2017. The start of Mr Xi’s second term has seen him in effect take charge of the economy through the mechanism of his central leading groups. He has also been able to place his supporters in key positions to help ensure alignment as the policy changes are rolled out. This year’s lending data are therefore likely to set a precedent for the future, rather than being a one-off blip. 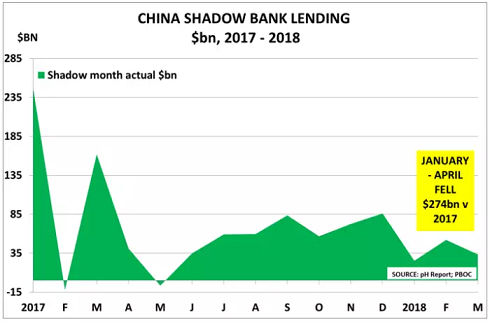 Although some of the shadow lending was reabsorbed in the official sector, TSF actually fell 14% ($110bn) in the first four months of the year. Already the economy is noticing the impact. Auto sales, for example, which at the height of the stimulus programme grew more than 50% in 2009 and by a third in 2010, have seen just 3% growth so far this year. The downturn also confirms the importance of Mr Xi’s decision to make “financial deleveraging” the first of his promised “three tough battles” to secure China’s goal of becoming a “moderately prosperous society” by 2020, as we discussed in February. 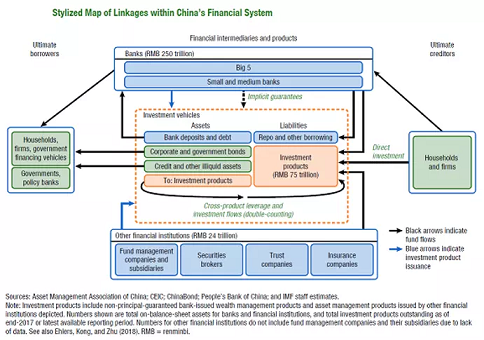 The problems relate to the close linkage between China’s Rmb250tn ($40tn) banking sector and the shadow banks, through its exposure to the Rmb75tn off-balance-sheet investment vehicles. The recent decision to create a new Banking and Insurance Regulatory Commission is another sign of the changes under way, as this will eliminate the previous opportunity for arbitrage created by the existence of separate standards in the banking and insurance industries for the same activity, such as leasing. As the IMF’s chart below highlights, lightly regulated vehicles have played a critical role in China’s credit boom. Banks, for example, have been able to use the shadow sector to repackage high-risk credit investments as low-risk retail savings products, which are then made available in turn to consumers at the touch of their smartphone button. This development has heightened liquidity risks among the small and medium-sized banks, whose reliance on short-term non-deposit funding remains high. The IMF notes, for example, that “more than 80% of outstanding wealth management products are billed as low risk”. Mr Xi clearly knows he faces a tough battle to rein-in leverage, given the creativity that has been shown by the banks in ramping up their lending over the past decade. The stimulus programme has also created its own supporters in the construction and related industries, as large amounts of cash have been washing around China’s property markets, and finding its way into overseas markets. 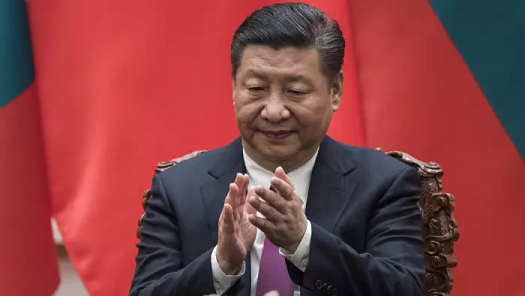 But Mr Xi is now China’s most powerful leader since Mao, and it would seem unwise to bet against him succeeding with his deleveraging objective, even if it does create short-term pain for the economy as shadow banking is brought back under control. As Gabriel Wildau has reported, the official sector is already under pressure from Beijing to boost its capital base. Analysts are suggesting that $170bn of new capital may be required by the mid-sized banks, whilst Moody’s estimates the four megabanks may require more than double this amount by 2025 in terms of “special debt” to meet new Financial Stability Board rules. Essentially, therefore, China’s lending bubble is now history and the tide of capital flows is reversing. It is therefore no surprise that global interest rates are now on the rise, with the US 10-year rate breaking through 3%. 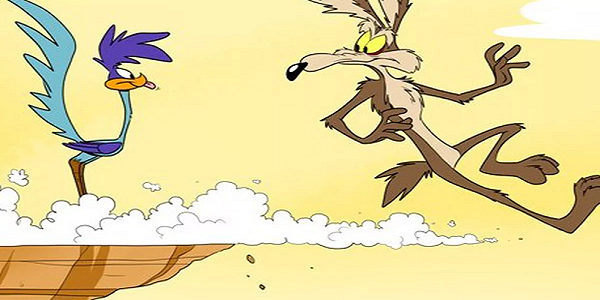 Investors and companies might be well advised to prepare for some big shocks ahead. As Warren Buffett once wisely remarked, it is “only when the tide goes out, do you discover who’s been swimming naked”. Paul Hodges and Daniël de Blocq van Scheltinga publish The pH Report.